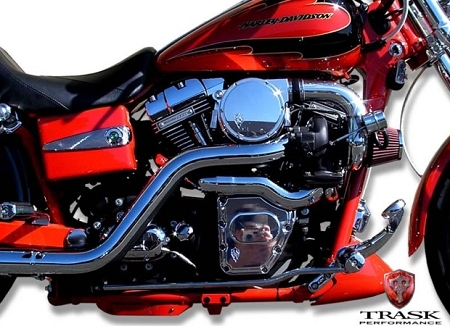 Trask EFI Dyna & Softail Turbo System Designed For 2005 & Later EFI Dyna / 2001 & Later Softail. No for any engine modifications. This system makes peak HP and TQ right where you need it, between 3,000 and 4,000 RPM’s. This system is a 100% complete bolt on and runs on premium pump gas. The system includes: Stainless steel head pipe w/heat shields, tail pipe with billet tip and heat shield, modified Garrett GT Series turbo w/8lb actuator, patent pending billet plenum w/ snap in velocity stack for in interrupted air flow, billet breathers, Trask intercooler w/billet top cap, billet boost gauge kit, a complete hardware kit (which includes a performance Barrnett clutch spring, high flow injectors and NGK spark plugs), step by step instruction packet. 5490 points will be rewarded to you when you buy this item.